I like planning and I like things going as planned. I’ve never been very spontaneous. Patrick is teaching me things. We thought we’d be heading home a couple nights ago. Patrick’s weekend was completely uneventful. He was healthy and happy and doing really well. Everything was in order – he was on the schedule for his line to be placed on Tuesday and then once it was in, we were going home. We’ve done that surgery outpatient before, so why not go home the same day, right? Monday night my nurse couldn’t find a record of him being on the surgery schedule, though.. even though I was sure they were planning on it because his surgeon had talked to me about doing it. All night long I had nightmares about him not getting his line. But before the sun was up Tuesday morning, I was signing a consent for surgery. That afternoon, out of the blue, surgical transport came to get Patrick. I had a pow wow with his surgeon in the hall on the way down then went through the usual presurgery consent and exchange of history, kissed him goodbye, and went to the surgery waiting room. Pretty routine. This time, though, things were just slow! This procedure usually takes 30-45 minutes. And an hour and 15 I was asking for updates from the O.R. But then, minutes later, his surgeon came to tell me the line was in and everything had gone well. Great, I thought, and sat down to wait again. Typically 15 minutes or so after the surgeon visits me I get to go back to recovery. 15 minutes passed and then the anesthesiologist came to talk to me. He explained that Patrick had somehow been extubated during the procedure, but that he thought he was ok.
2 hours after I got to the waiting room, they finally called me to recovery. Patrick seemed to be just fine.. mellow and with tears dried in his hair, but ok. We brought him up to the room and he cuddled up with me in the rocking chair. Soon it was time to give his afternoon medicines. Because of his allergic reaction to the caspofungin, they give him Benadryl first now and that on top of the anesthesia helped him fall very fast asleep. Brian came and packed up the room. The doctors came and gave me discharge instructions and prescriptions. We were just waiting out the medication and waiting for his TPN to be delivered. Then I noticed that Patrick felt rather warm. So, reluctantly, I paged the nurse and asked her to check his temperature. The result – 103.3. Just then, the TPN arrived.. the last piece we’d needed to go home. And we were staying. They drew a bunch of labwork to look for infection, just to be safe. Patrick’s lungs seemed a bit coarser than normal and he had a cough. The doctors theorize that the fever was a result of something that happened with the anesthesia or his airway while he was in the O.R. Throughout the night, he finally got some good coughs and his fever went down. By morning, he seemed to be just fine. They stopped the antibiotics they’d added as a preventative measure. So – here we are still. I’ve learned never to really count on the first discharge date we plan for… but we were so close this time!! We’re ok, though. We’ve got a fair amount of cabin fever. And I’m definitely missing some of the comforts of home like soft toilet paper and going barefoot. But we’ll make it through. At least he’s happy and healthy and allowed to leave his room to go to the playroom where he can spend hours running around the room holding my hand with one of his, and pushing a push toy or chair with the other while i try to keep up with the IV pole.. keeping his feet out of the tubing. We’re hoping to go home maybe tomorrow morning, now. <Knock on wood>. To do that his cultures have to stay negative and he has to not give us any more surprises. This entry was posted in Brian, Central Line, Infections, Life as an SBS mom, Medical updates, Short Gut Syndrome and tagged anesthesia, aspiration, fevers, home health care, hospital stays, medication allergies, Primary Children's Hospital, scary moments, special needs parenting, surgery, surgery complications, TPN on May 13, 2010 by geekino. Last week was one of the harder hospital stays we’ve had, and I think it’s because there was so much waiting for answers to scary questions… and while we waiting Patrick didn’t feel all that sick and couldn’t figure out why his boundaries were suddenly so much smaller. Had he not discovered opening and closing cabinet doors as a way to spend his time, I think I’d have been a goner. After 3 days, the lab tests showed that the infection was, in fact, the same infection Patrick had back in January. This type of bacteria can sometimes live in the plastic of a central line. The doctors theorize that the reason Patrick only sometimes had low fevers and only sometimes acted sick was that the infection was living in the line and only sometimes making its way into his bloodstream. The best way to make sure Patrick got better was to take out his central line. So – Thursday afternoon they took Patrick to do an ultrasound of his veins to see where a new line could be placed. Friday morning they explained a plan to me that involved removing his broviac line and putting in a temporary PICC line instead. (Please see previous blogs for descriptions of the differences between these lines). After 3 days, they’d take out the PICC line and put in a new broviac line instead. I explained again that we’d been told that Patrick couldn’t have PICC lines because of the collateral vessels in his shoulders. But – it was better to try than to plan for peripheral IV’s in his hands and feet for 3 days.. So we went ahead. Both the broviac removal and the PICC placement are sedated procedures and it took some talking to convince them that they could be done at the same time – but, despite a full-to-overflowing hospital, they made it happen. We got ready by putting an IV in his hand where contrast could be injected and an NG tube down his nose to drain his stomach and make sure he didn’t vomit and aspirate again. This took over an hour to do. Patrick has learned to block tubes with his tongue as they try to pass them down his throat. It took several tries and a very crafty charge nurse to finally get it all done. With music therapy there to try to help calm him down, the room seemed a bit like chaos. In the end, Patrick was exhausted and furious. I took this picture as I tried to calm him down right before he fell asleep from total exhaustion. Late afternoon on Friday, they took Patrick to Special Procedures where they use a technique called fluoroscope to view the blood vessels to view the blood vessels as they work. The anesthesiologist gave Patrick a dose of Versed and let me hold him as it put him to sleep. This was a first for me, and interesting to see his reaction. First he got all giggly. They he took my face in both hands and gave me a big sloppy kiss on the mouth. They he went kind of limp and I put him on the procedure table and left as he was drifting off to sleep. Less than an hour later, they called. They explained that he did indeed have collateral vessels that made a PICC line impossible. However, they’d put in a deep peripheral IV that would better survive the 3 day wait. Picking Patrick up, I learned that Versed does two things to Patrick. It makes him loud, and it makes him fearless. He spent the entire ride to his room and then at least an hour afterwards yelling “Hi!” at the top of his lungs to every person who passed by.. including the ones all the way out in the hall where they couldn’t see him. He also took to jumping and climbing and bonking his head into things. (He still has a bruise between his eyes from this game). Soon he got tired and went to sleep. And we went back to waiting. Surgery requires a 3 day wait before they can put in a new broviac line whenever one is pulled for infection. In the meantime, the sugar in Patrick’s TPN had to be reduced to prevent damage to the peripheral vein. This meant he didn’t feel quite as well. He also kept the IV in his hand because we don’t dare take out any working IV, for fear we won’t get one later when he needs it. Patrick didn’t want to slow down, though. Within a day he’d figured out how to still crawl with a splint on his hand.. he was determined to stand at the side of his crib.. and he taught himself to sit up to make sure that no one else would be able to get away with trapping him by laying him down. It was an exhausting 3 days because he was extra motivated to stay active, despite his new restraints. Finally, Monday rolled around and Patrick was eligible for surgery again. We waited all day, and finally Patrick’s doctor told the nurse to call and see what was taking so long. We found that his name had been accidentally left off the schedule. They added him at 4 and around 6:30 took him down to surgery. While we waited for the anesthesiologist to come, Patrick was his usual bundle of energy. He discovered a pretty big blue button on the wall that he pushed. He was thrilled by the alarm that sounded and how quickly people made it to the room. Yes, he found and pushed the “Code Blue” button that is used to call emergency help when a patient stops breathing or worse. I caught on and cancelled the alarm as the anesthesiologist got to the room. He only got to the button once more as we talked, which just got a big grin from the doctor. The pre-surgery talk with this doctor scared me. He explained that there were big risks in intubating when Patrick had RSV. He also explained that the surgery might take a long time, as they didn’t know for sure how hard it would be to get a line. Again, they gave Patrick a dose of Versed and I kissed him as he drifted off then went to the waiting room – a nervous wreck. Howie joined me about 15 minutes later, and after another 15 minutes the surgeon appeared and explained that they’d easily gotten a line in. When I got to the recovery room, Patrick was trying his best to sit up while everyone else tried to keep him laying down. An hour later, though, in the room, he was up and full of energy. Again, he was fearless. His nurse kept calling him “wild” as he would quickly try to escape guarding hands to stand and jump, etc. Fortunately, by 10 he wore himself out completely and other than being woken by vitals, slept through the night. Tuesday morning, we were finally able to go home. We arrived home almost exactly 7 days after we were admitted to the hospital. When you’re confined in a little hospital room, you don’t necessarily notice all the learning your child has done. Patrick is now able to sit himself up and just needs a little more practice to master crawling on hands and knees. He’s playing peek-a-boo and other interactive games. He is a HANDFUL and it seems as though it came overnight. He was so happy to be home with space, though, and so was I! It’s so much easier to contain a tornado if it has a little bit of space to bounce around in. We’ve had to adapt some, though, to adjust to his new skills. It’s no longer safe to use the changing table. Patrick did manage to break his line his first morning home, so we spent yesterday morning up at the hospital getting it repaired. (Big thanks are owed to the GI staff who managed this in their clinic and saved us a trip to a very overworked ER). Between that adventure and his daily appointments this week, I was quickly reminded that, even at home, keeping up with Patrick and his needs is plenty of work. We did see his pediatrician yesterday and she was all grins as she handed me a growth chart that showed Patrick’s weight in the 5th percentile! He’s always been well under the lines on the growth chart. We’ve never even talked percentiles. I don’t know how we’ve been so blessed that, even with infections, he’s been really very healthy for so long. But we are grateful as we take each day at a time. Some days are harder than others, but at least this week, the outcome is worth the wait. This entry was posted in Central Line, Infections, Life as an SBS mom, Medical updates, Motility problems, Patrick, Short Gut Syndrome, Surgeries, Uncategorized and tagged anesthesia, Broviac line, collateral vessels, fevers, funny things Patrick did, growing up, hospital stays, infections, IV's, music therapy, NG tube, PICC line, Primary Children's Hospital, proud moments, scary moments, surgery, surgery complications, the ER, trials and triumphs, weight gain on February 25, 2010 by geekino. As many of you know, Patrick had an appointment for a check-up at Seattle Children’s this week. He was scheduled in clinic for about two hours Tuesday afternoon. We decided to try to make a family vacation out of this trip (since we haven’t had a vacation since adopting Patrick.) I think we need to stop saying the word vacation in our household. It seems that Patrick thinks that vacations are taken in the hospital – this trip did not go as planned. We flew to Seattle on Sunday. We rented a mini van and drove to visit our good friends, the Laylands who live half an hour north of the city. We had a good dinner and visit with them and then spent the night at their house. As soon as the plane touched down in Seattle, my nose started to run. At first I was sure it was allergies, but by the next morning there was no question that it was a cold. But, we were determined to have a vacation, so after a quick stop at K-Mart for some cold medicine and other things, we set off for the city. After picking up some much touted Mighty-O donuts and checking into our hotel, we headed to the Seattle Aquarium. We were in the first exhibit, a sort of aquatic petting zoo, letting Patrick play in the water and touch sea creatures when I looked down and noticed blood on his PICC line. Closer examination revealed that there was something wrong … there was definitely a leak. So I made a quick call to our transplant coordinator and we headed back to the ER, leaving a very patient Lindy and her daughter stranded in downtown Seattle to avoid exposing them to hospital ER germs. We were checked in quickly in the ER and sent to an isolation room at the back because of Patrick’s and my cold symptoms. Soon the IV team came to look and confirmed that Patrick did, indeed, have a cracked PICC line. And it could not be repaired. As a result, Patrick needed to have a peripheral IV put in until he could get another central (goes to the heart) line. And he needed to be admitted to the hospital because you can’t get as good of nutrition through just a hand or foot. Wednesday afternoon, there was finally room in the schedule to take Patrick to “Interventional Radiology” where they could place a new PICC line with X-ray imaging to guide them. They took Patrick down at about 3 p.m. At 5:30, a doctor came to the room to talk to us. He explained that they had tried to pass the wire through Patrick’s vein to put in the PICC line and had run into resistence. So, they injected contrast into his veins and saw that there had been a clot. In response to the clot, Patrick’s body created a branch of smaller vessels to route the blood where it needed to go. This meets the body’s need, but doesn’t leave enough room to put a catheter into the vein to the heart. Because of this, Patrick can no longer have PICC lines in his arms. They put a little bit more stable of a line in his arm then that wouldn’t go bad as quickly as an IV in his hand or foot and then gave us two options: stay here and have a broviac line put in, or fly to Salt Lake, be admitted there, and have a broviac put in. We decided that it was best to just stay and have it done here in Seattle. The surgeons here had gone into the PICC placement procedure and had seen the problem first hand. Having Seattle Children’s put in the line also meant that he’d have it done sooner, since he could be put on the next day’s list. Beyond that, in order to place the line, they needed to do an ultrasound study to see what Patrick’s remaining central blood vessels looked like. Since not having many available blood vessels moves you up the transplant list, we thought it was wise to have the transplant hospital have a record of what options remained. So – yesterday Patrick had a new broviac line put in. He went to surgery about 3 p.m. and they were able to put the new line right where they wanted it. When I talked to the surgeon at 5 he sounded pretty good about how the procedure had gone. There had, however, been one slight problem. Patrick’s stomach still doesn’t easily drain all the way. Even though he hadn’t eaten anything, and his stomach had been suctioned, it still wasn’t empty. As a result, he aspirated during the procedure. The surgeon said that they’d been able to clean out his lungs, though, and didn’t seem overly concerned. With any aspiration, there is a risk of pneumonia. He asked to keep Patrick 24 hours for observation, and then said he’d be able to go home. I went to Patrick’s room to wait for him. When he finally made it upstairs, he was very upset. He’d curled himself into a little ball and was crying miserably. The nurse immediately set to work getting pain medications for him. And we decided to put him on monitors. Things just seemed to get worse. The monitors showed that the oxygen levels in his blood were dropping, so we put an oxygen mask near his mouth to help keep them up. His heart rate was rising. He was breathing very heavily. 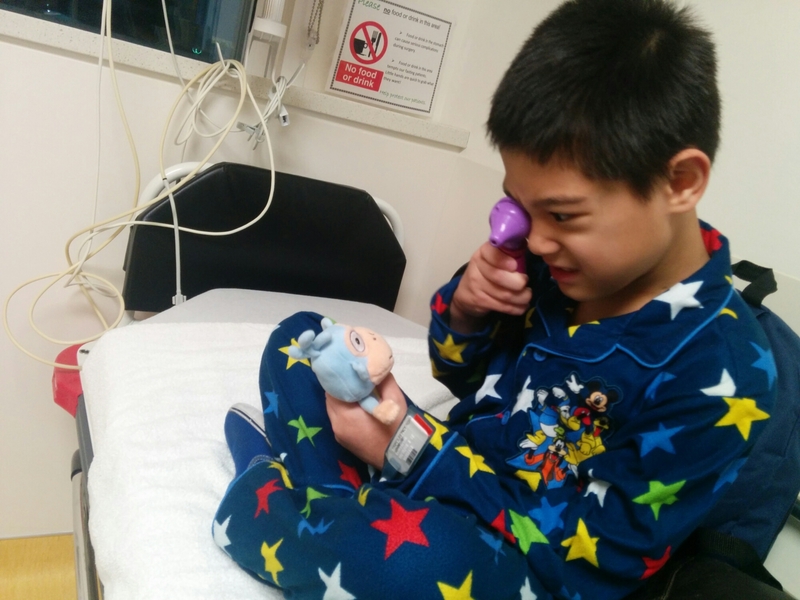 The nurse called in other nurses to help her and started taking vitals… And discovered Patrick was running a fever. They called down his doctors. While I explained the scarier things in Patrick’s medical history, his nurse wandered around the room making space to work if things got worse. They ordered blood cultures to look for infection, gave Patrick some Tylenol, and got an X-ray of his chest. Finally, they called the “Rapid Response Team”, which is a team from the PICU who come to the bedside. They watched him, took some tests bedside, and promised to come back to check on him within the hour. Once all of the tests were done, I picked Patrick up again and he finally started to calm down. They started antibiotics while I rocked him to sleep. His heart rate was still high, and the antibiotics were making his blood pressure low, but he seemed to be starting to feel better. As things started to settle down, I asked the nurse to help me reach elders from my church. One of the doctors in the room had mentioned earlier in the week that he had gone to school at BYU and we’d talked about how we’d been there the same year both studying Spanish. He spoke up and said “I can take care of that for you.” It was subtle, but we both understood that he was telling me that he was an elder and could help me with what he knew I was going to ask for. In the Church of Jesus Christ of Latter Day Saints we believe in the gift of healing by the laying on of hands by those who have authority from God. Brian is an elder in our church and had given Patrick one of these special blessings before he left. And this kind doctor subtly waited around until the nurses had left the room and then layed his hands on Patrick’s head and gave him another blessing, confirming the promises of health and comfort and strength. Patrick slowly began turning around. His fever dropped and he started to sleep comfortably. A respiratory therapist came and tried to get Patrick to cough by pounding on his chest and back. Finally, she suctioned deep down into his chest and helped to get a lot of what was in his lungs out. By midnight, Patrick was sound asleep. I stayed up to help the nurse get a few more things settled and went to bed. We slept till 7 a.m., when the doctors came in to check on him. This morning, Patrick woke up with a smile. He was a bit weak and groggy at first, but has just gotten better and better all day long. Just an hour ago, he was climbing all over me on the couch in the room playing with toys and jumping. You would never know anything had been wrong. The doctors are pleased enough with his improvement that they gave me the go ahead to book a flight back home for tomorrow. We’ll leave the hospital a little after noon to catch a 3:45 p.m. flight. We should be home by 6 p.m. I almost hate to write this because any time I’ve said that we were doing something this week, things have changed. But this time it feels like we really are going home. And I’ll be happy to be there. I do have to share one example of the goodness of people in this world. While Patrick was in surgery, I put some of our clothes in the laundry room here. I got it as far as the dryer, but then when Patrick came back in such bad shape from surgery, didn’t make it back to it. I expected, when I headed back at midnight, to find my clothes piled in a basket somewhere. Instead, someone had taken the time to neatly fold them for me. This touched me because any parent using the laundry room here is doing it because their child is sick enough that they’re expecting to stay here for some time. The person who folded my clothes was certainly going through their own difficult time and would have been totally justified in being upset and offended at someone leaving clothes in a dryer. Instead, they took the time to make my day a little better. This is just one example of the kindnesses that make raising a child with health problem so very rewarding. This entry was posted in Central Line, Faith, LDS Church, Life as an SBS mom, Medical updates, Motility problems, Patrick, Priesthood, Seattle Children's Hospital and tagged aspiration, faith, fevers, friends, hospital stays, IV's, PICC line, PICU, priesthood, scary moments, Seattle, Seattle Children's Hospital, surgery, surgery complications, trials and triumphs on December 10, 2009 by geekino.